Terraria has been around for three years now and much like its most obvious inspiration, Minecraft, it has been supported with regular updates and now arrives on the PS4 somewhat more complex than it did when it first launched on consoles in the previous generation. What you get here is the latest console version (it has parity with the current PS3 and Vita versions) which has more than enough content to keep you busy for the length of the average jail sentence for, say, drink driving into a street full of occupied prams. For the uninitiated, Terraria is a side-on 2D Minecraft clone essentially. I’m not going to explain Minecraft. Go and ask any child within a mile of you what it is and they’ll tell you in great detail. In both games you’ll be wandering around a large area (the largest yet in console versions) and digging through dirt, stone, snow and sand in order to get to the goodies underneath. These can be precious metals and gems or chests with hidden treasures. As you progress, you build new tools and equipment, effectively upgrading your character. The main thing is progress. Finding new stuff is as powerful as the best loot-based RPGs. Especially given that, when you start, you’re basically about as useful as you’d be in a desert island. So when you start picking up double-jump boots and crazy weapons, it’s pretty satisfying given all the digging you have to do. You spend a lot of time slowly tunneling to places in the hope that a hidden chest or a nice stock of precious ore will show up and that could seem a little, well… dull. And it sort of should be, but like Minecraft, it’s something you accept and it just makes your finds that much more special. Terraria eats up the hours but never really feels like wasted time which is pretty remarkable given that it’s totally wasted time. Where Minecraft was more of a LEGO set than a game (at least initially), Terraria‘s creative side is much more based around practicality. You need to build rooms to attract NPCs, you’ll want a place to put your workbench, furnaces, and other appliances, and you’ll need a place to store things in a fairly ordered fashion. Sure, you can build a big ornate castle but it is more likely that your base will be more functional. As you progress you’ll unlock more and more things that you can use and your base will expand. I’m not about to be building giant Danny Dyer monoliths, that was Minecraft‘s thing. However, the game itself here also follows that practical approach as you work towards summoning, and beating, a series of bosses. There is a linearity to your objectives that the sprawling exploration elements belie. You are always working towards an outcome, giving the game a bit more purpose than Minecraft (at least before they patched in the end game). With its retro aesthetics, Terraria has never been one to turn heads, and it certainly doesn’t attempt to fully utilise the power of the PS4. Everything certainly looks clear and sharp, but it always did. You can zoom out and see the area around you in sharp focus (and the Dual Shock 4 allows this by having you pinch-zoom with the touch pad) but there’s nothing here that elevates the game above the PS3 version. Indeed it has cross-save functionality with the PS3/Vita so it was never going push any boundaries. It is also a cross-buy title but unfortunately only one way. Buying the PS4 version gets you the others but not vice versa. 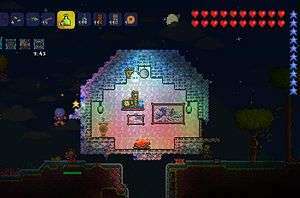 The devs are promising a new mobile app companion for the game but this is a little way off so what you are getting here is just Terraria as we know and love it. If you own the PS3 version then the only reason to get this is to save you swapping your cables over but if you’re new to Terraria, then this is one hell of a good game and a fine alternative to Minecraft and one that promises to steal away weeks of your life. Which is good as it’s a bit cold outside at the moment. A huge slab of chilled out, addictive gaming. Hardly exploits the next gen power of the PS4. Is quite an old game now. Trophy whores really have their work cut out compared to the already time-consuming vanilla PS3 version. 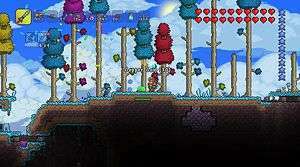 Terraria arrives on the PS4 with a heap of content but no real improvements. If you're new to the game, we can thoroughly recommend it but if you own an old version then this PS4 iteration doesn't give you any reasons to pick it up again.